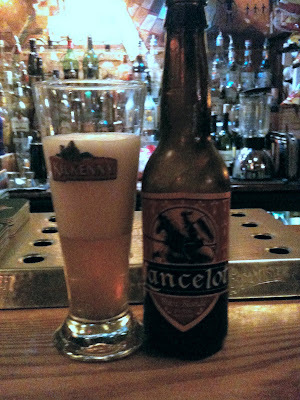 Last night at WOS Bar, where I watched NFL football (end of Minnesota/Cleveland game and then all of NY Giants/Washington), the bartender Pierre recommended a new French beer called Lancelot. In fact, it apparently is so new, I can't even find anything out about it on the internet!?!? I actually thought it was quite good. So much so that I had 5 bottles while watching football!